I want to make a pair of mittens, and I am consumed with the thrill of the hunt. I've spent two days looking now and although I have seen many wonderful mittens, none of them are quite right. I feel like I'll know it when I see it, but right now I feel pickier than a two year old. I click and click, look and look, and all that I keep thinking is "that's not it, that's not it, that's not it... those are too big and those have too many colours and those have a funny thumb and I don't want cables and those are the wrong gauge and... it turns out I have all sorts of feelings about mittens. Here (apparently, since I've rejected any pattern that doesn't fit this list) are my criteria. -The mittens should be fine and fancy, like presents for your hands in the winter. There is very little to bring a woman happiness in February, and I depend on mittens for a great deal of my joy. I have good plain mittens for warmth. These will be for dress. I like 'em fussy. 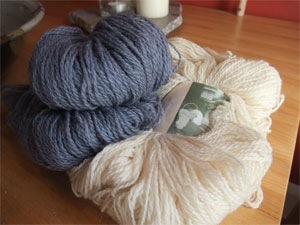 -They should be two colour mittens, since I have two colours of this beautiful Gauja Wool. I bought it at the Knitters Fair last year (or the year before, I forget) and I'd forgotten how much I was looking forward to using it. - They should be classic. I love the traditional look of Norwegian, Latvian or Selbu mittens, and I'm yet to embrace the modern non-symetrical mitten like Anemoi. Not saying they aren't darn pretty, just .... well. That's not my mitten. - They should not have squirrels on them, for while that mitten (and these ones) are very pretty, I prefer not to immortalize my enemies. I fear the mittens would be found after I am gone and misinterpreted as reverence rather than irony. -They should not be too wide, because that's not an elegant thing in a mitten. - They should have a pointed top and thumb for I think that dress mittens should always have pointed tops, and there's almost nothing you can say to convince me otherwise. -They should not have ribbing, because it turns out that I think that's for "common" mittens. - They should not be "fingerless" mittens, because (and I really can't stress this enough) this is Canada. - They should not be gloves, for gloves make your fingers all lonely. - I am enamored of snowflakes, and think that a blue and white snowflake mitten would simply be the bomb. I dream of a pointy snowflake mitten. See the problem? I'm apparently rather fussy, but I truly believe that my ideal mitten is out there, and that one of you knows where it is. Mitten hunt, anyone?